TO ACCESS YOUR ADVANCE COPY of the winter journal, please make sure your membership is up to date here. An individual membership is $50 and a corporate membership is $120. Thank you! Unelected redevelopment commissions should not have the power to take money from other parts of government for a Tax Increment Financing (TIF) project, especially ones that never come to reality like the charades in my city. “It’s a Ponzi scheme” our county auditor said of the way TIF is used. One project would come along, sometimes a legitimate development involving a major corporation such as Dollar General, but the next time involving a developer with little to no capital — no matter the deal, there was need for another “development” to sustain income. The auditor explained that TIF funds would initially flow into the city faster than the payment schedule for the bonds. That provided money the city could spend on anything plausibly called infrastructure. The main thing, though, was to have another TIF on the way to keep the cash flow going. “You always got to have another deal in the chute,” he said. But there comes a time when every Ponzi scheme collapses. In my city and the others examined in this special issue, the taxpayers are picking up the pieces by spending a lot of money for nothing. Introduction | TIF: ‘It’s Always Something’ (Penticuff). 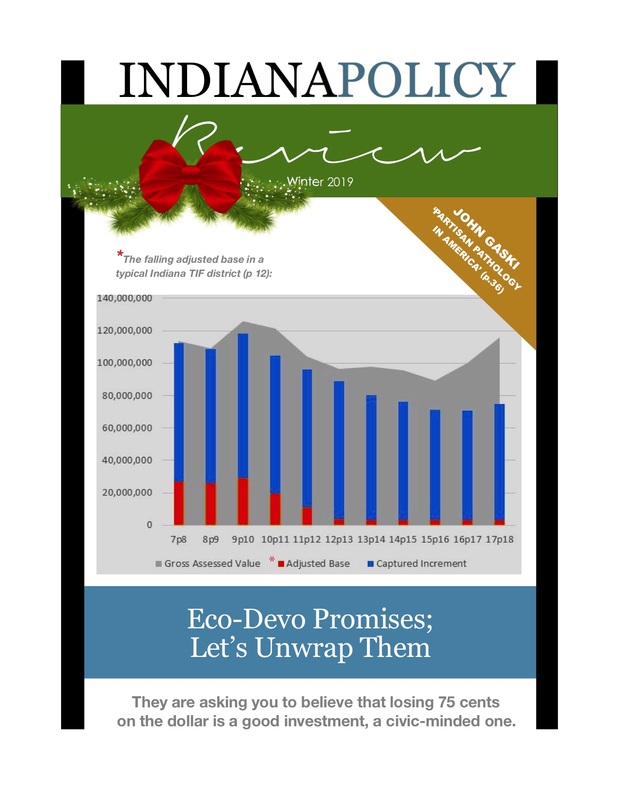 Cover Essays | The Eco-Devo Promises: Let’s Unwrap Them (Arp); Economic Development: Does It Mean Anything Anymore? (Cummins); Redevelopment Redux: South Bend and Elkhart (B. Keating); As TIF Revenue Increases, Transparency Is Lost (Davidson). Special Report | Partisan Pathology in the U.S. (Gaski). Leo Morris | The GOP: Untangling a Moral Knot; A History of Negative Campaigns; Political Parties: It’s Best to Choose; Media Leaves Us in the Dark; A Reunion of Gratitude, Respect; The Kavanaugh Treatment; We’re Getting Only Part of the Story; A Hesitant Chamber’s ‘Neutrality’; Numbers Everyone Should Know; Stamping Out Road Rage. Backgrounders | A Draft Card Story; Amending the Constitution; A Conservative Supreme Court? ; A Return to County Fairs; The Other Father of Our Constitution; Immigrant Namesakes (Franke); Bourbon and Taxes; Lincoln’s Trade Epiphany; Beware the Cost-of-Living Index (Van Cott). The Franke Bookshelf | Hayek Versus Keynes; The Perfectionists. The Outstater | Give Supremacy a Chance; The Surreal Mr. Brees; Inequality Understood; Lawyers at War.